A little different is the completion of multi-colored ink containers, first we do not know what color is in the second chamber, where there is a particular ink. Therefore, before filling the chamber / s is the right to be prepared. So prepare appropriate thickness wire or needle may be such as is supplied complete with ink and make extra holes that will make up the ink in the chamber. Point C (see photo below) shows the places where so roughly follow the additional holes. Why do we do these extra holes, so that at the time of filling the ink is considered excess air vents and thus no pressure builds up through the bottom of the ink ejecting nozzles. Of course, always a bit of ink through a nozzle to get out, depending on how quickly we will make up the ink and the air in its entirety does not manage to escape vent. That's why we do all the work taking care of cleanliness and do not hurry up slowly but surely. The holes are made in the following manner if we are at home or vice please someone help you to hold the container while making holes to ink refill ink. As we already have a container attached to heat the tip of the needle, the tip of the wire can be heated with a lighter and attach to the container in a place designated point C. We make the holes how much is container colors. Do not drill holes and hot melted because during drilling at the very end, to the chamber of the ink particles reach us chip that effectively damage the nozzles in the head. After the holes and leveling irregularities on the edges with a knife. We can begin to examine how much is the ink chamber and what is the color. For this toothpick is perfect but that the kind of round, they are not too thick but with a knife or sandpaper can do a toothpick even thinner. And we can also use a needle attached to a set of printer inks, but it will be difficult to determine the amount of ink us only what we can determine what color is on the tip of the needle. The probe because it is what we call explore color and amount of ink put until you feel a slight resistance. I still do not try to put as uszkodzimy printhead. Note that the black ink cartridges such as photo below has a capacity of 10ml to 20ml (actually from 15ml to 25ml). as regards the containers multicolor the same type as follows (see photo below), the chamber for each color to the 8ml max. Except that we do not fill the empty ink cartridges only complement the amount of ink consumed for printing. Caution! - Do not allow the total amount of ink from the container. Because the souls of the last remnants of ink are blocked for good, and the blockage is caused by the temperature which is given ink in the nozzle. The rule is that the message about the state of the ink in the ink container is low and is shown graphically that I've used up two thirds the amount of ink to fill the ink immediately. 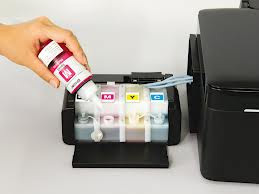 It is known that only Epson can buy the device to reset the amount of ink in other printers, power on the printer, wait until the message appears on the display LC printer with low ink status. Then, press the red button usually introduced to delete the last entry (red button with a cross). To turn off the message which appears on the screen after the ink status in a container and should be replaced. Press the reset button once and how you will get back is to press a second time so as there is no black ink and a color in a second container. I do not give how much to pour ink into each chamber to be quite alone and attention when filling the container with ink will not be the message that the box is full even though it will fill the very edge of ink have been here all depends on your vigilance. So after a while you have to carefully pay attention to the output of the printer and look at the printed characters. Of course, who is printing often and much needs to check more often and who occasionally prints are just that once a week, a month check how the printer prints. After filling the container label which was glued to the container and naklejiona zakąłdamy / install the cartridge in the printer / device.